How can I have an effectual prayer life? | For What Saith the Scriptures? Category Archives: How can I have an effectual prayer life? How can I have an effectual prayer life? Friend, if you are familiar with sermons on prayer, you have heard at least once a reference to Elijah’s “effectual” praying. James 5:16-18 says: “ Confess your faults one to another, and pray for one another, that ye may be healed. The effectual fervent prayer of a righteous man availeth much. Elias was a man subject to like passions as we are, and he prayed earnestly that it might not rain: and it rained not on the earth by the space of three years and six months. And he prayed again, and the heaven gave rain, and the earth brought forth her fruit.” Why did Elijah pray like this, what was so special about his prayer that God answered it, and how can we have our prayers answered of God? We answer these questions in our special-edition Bible Q&A article #300. A preacher recently said that his ministry has received over 93 million prayer requests through the years. He estimated that there were “several million” answers to prayer. Yet, what happened to the tens of millions of prayer requests that went “unanswered?” Did God not deem them worthy of an answer? If you were to survey Christians about their prayer lives, there would be an overwhelming response and great concern about unanswered prayer. For example, the aforementioned preacher discussed how he had even prayed over a lifeless girl’s body, and how God never did bring her back! Why is it that people often pray for one outcome and the very opposite occurs? To further complicate the matter, Jesus said He would do “whatsoever” we asked in His name: “ And whatsoever ye shall ask in my name, that will I do, that the Father may be glorified in the Son. If ye shall ask any thing in my name, I will do it” (John 14:13-14). Matthew 18:19 is often appealed to regarding prayer: “Again I say unto you, That if two of you shall agree on earth as touching any thing that they shall ask, it shall be done for them of my Father which is in heaven.” And yet, when two Christians join in prayer, believing exactly what Jesus said, the verses do not work the way one would expect. Why? Can you see why unanswered prayer is such a sensitive subject? What was to be a blessing is now a burden! What is going on? Does the Almighty throw away prayer requests? If our prayer requests go unanswered, then why bother to pray at all? Elijah in James 5:16-18 provides valuable insight into this most personal and most perplexing topic. The Apostle James, writing to believing Israel (1:1), says in James 5:16: “Confess your faults one to another, and pray one for another, that ye may be healed. The effectual fervent prayer of a righteous man availeth much.” Prayer, in the Bible, is something that “righteous” people do, that believers do, not lost people. That being said, there is no so-called “sinner’s prayer” in the Bible for lost people to pray to be saved. Saved people pray in the Bible. If you were to take a concordance and find and consider the Bible verses concerning prayer (especially the contents of believers’ actual prayers), you would see that they were always mindful of God’s Word to them. God spoke to them first and then they spoke to God: prayer according to God’s will is absolutely, unquestionably, essential. Elijah lived in a time of great spiritual wickedness in Israel (the northern kingdom, the 10 northern tribes). King Ahab and Queen Jezebel made Baal worship the official state religion of the northern kingdom. This pagan idolatry seduced the Jews, drawing them away from JEHOVAH God (in direct violation of the first and second commandments of Exodus 20:1-6). As a believer and a prophet, Elijah knew God’s Word to him before he prayed to God. Yes, Ahab was a devilish king (the perfect match for devilish Queen Jezebel!!). As if his predecessor Jeroboam were not wicked enough, Ahab outdid him… and the other previous wicked kings of the northern kingdom, too! Ahab “did evil in the sight of the LORD above all that were before him.” He married a pagan woman, someone who rejected JEHOVAH God, and then he built a house and an altar for the pagan god Baal in JEHOVAH’S land! He also made a “grove” (another place of false religious worship). “And Ahab did more to provoke the LORD God of Israel to anger than all the kings of Israel that were before him.” The nation followed him in that error! This rank paganism is the context of the Prophet Elijah’s ministry. Now we begin to see why he prayed as he did in James 5:17-18. In the closing verses of the sixteenth chapter of 1 Kings, we learn of the ascension of a new king in Israel (the northern kingdom)—Ahab. As Aquila and Priscilla made a great husband-wife ministry team for the LORD in the New Testament Scriptures, Ahab and Jezebel made a great husband-wife “ministry” team for the Devil in the Old Testament Scriptures! Ahab and Jezebel encouraged the common Jews to worship the pagan god Baal: Ahab built a house for Baal, an altar for Baal, and a grove (trees carved into poles used as a heathen shrine). Later on, Jezebel did not think twice about eliminating competition—she killed the prophets (messengers) of JEHOVAH, even attempting to slay Elijah! Israel’s decline into paganism under Ahab and Jezebel, both in its leadership and general public, caused the Holy Spirit to move in the Prophet Elijah and confront Ahab: “And Elijah the Tishbite, who was of the inhabitants of Gilead, said unto Ahab, As the LORD God of Israel liveth, before whom I stand, there shall not be dew nor rain these years, but according to my word” (1 Kings 17:1). Of all judgments, why did Elijah select a drought? Elijah knew that Israel’s operating system was the Mosaic Law. Moses had said in Deuteronomy 11:16-17: “ Take heed to yourselves, that your heart be not deceived, and ye turn aside, and serve other gods, and worship them;  And then the LORD’S wrath be kindled against you, and he shut up the heaven, that there be no rain, and that the land yield not her fruit; and lest ye perish quickly from off the good land which the LORD giveth you.” Elijah simply studied his Bible to find out what JEHOVAH would do in response to Israel’s pagan idolatry, and Elijah prayed for that to happen. With idolatrous Ahab and Jezebel leading Israel, Baal (devil) worship infiltrated the northern 10 Jewish tribes. The seventeenth chapter of 1 Kings states that Elijah the prophet confronted Ahab, and told him that it would not rain for some time. Over 600 years earlier, JEHOVAH had warned Israel through Moses that, if the nation embraced heathen religion (idolatry), a drought was imminent and Israel’s crops would fail (Deuteronomy 11:16-17). Elijah simply prayed in line with what God was doing with Israel concerning the Mosaic Law—if Israel failed to keep the Law, if she worshipped and served other gods, she would be cursed of the one true God. While we must now break away from the story of Elijah, Ahab, and Jezebel (you can read the resolution in 1 Kings chapters 18-21), we will return to the subject of unanswered prayer, its cause and cure. When God made the covenant of Law with Israel at Sinai, Moses made it very clear to them that they had to obey all of God’s commandments to receive His blessings (Exodus 19:3-6). If they broke that contract, He judged them, not to get even but to reform them (which reformation they usually refused). According to chapter 20, verses 1-6, the first two of the Ten Commandments forbade Israel from worshipping and serving other gods, and from making graven (carved) images. During the reign of evil Ahab, Elijah prayed for a drought because that is what God said He would do in the case of Israel’s idolatry. A drought came and lasted 3½ years (cf. James 5:16-18; Luke 4:25,26). What if Elijah had prayed for a global flood? That would have certainly gotten Ahab’s attention! After all, did God not promise in Genesis chapter 6 that He would flood the world because of its wickedness? Certainly. Why did Elijah not behave like today’s “name-it-and-claim-it” proponents, grabbing random verses, ripping them from their contexts, attempting to make God grant his selfish desires? Firstly, Elijah recognized the dispensational boundary between Genesis chapter 9 and his day. God was not dealing with Israel on the basis of the promises He had made to Noah and his contemporaries. Genesis chapter 6 was not God’s Word to or about Israel. However, Deuteronomy was God’s Word to and about Israel, and because Deuteronomy was in God’s will for Israel, Elijah prayed in accordance with it. Secondly, God promised never to flood the world again (Genesis 9:8-17). Had Elijah not recognized these two facts, had Elijah not recognized God’s Word to him (as a member of the nation Israel), his prayer would have gone unanswered and he would have been disappointed and confused. This corrected view of Elijah’s prayer thus adjusts our view of prayer. Elijah believed God’s Word to him. He had a dispensational view of the Scriptures: he did not “name and claim” for Israel verses that God had not spoken to or about Israel. Elijah’s prayer life was patterned after God’s Word to the nation Israel, of which he was a member. There was pagan idolatry in Israel; Deuteronomy 11:16-17 predicted that God would shut up the heaven and prevent rain from watering Israel’s crops; and Elijah’s will was to pray in perfect accordance with JEHOVAH’S will. Elijah was not disappointed because He did not try to make God do something He never said He would do. If only the average church member could take to heart and practice the integrity with which Elijah handled the Holy Bible. Prayer meetings and prayer requests prove most people are asking God to do something He never said He would do for us. No wonder there are so many unanswered prayers! People are grabbing Israel’s verses, promises God made to Israel, and making as though those verses are to or about us. Preachers talk about literally raising the dead as Jesus did; or literally laying hands on sick people as Jesus did and having them miraculously recover without medical intervention; or God miraculously adding zeros to the end of our bank accounts as He did with Abraham, Isaac, Job, and King Solomon; or God sending angels to protect us as He did with the apostles, the kingdom of Judah, and Peter. Dear friends, unanswered prayer is not because God is unable or uninterested. Remember, we cannot limit God but we cannot force Him, either. Still, God is God, and He can limit Himself. If He says He is not going to do something, we would be unwise to think that we were God by making Him do what we want. Beloved, it bears repeating—prayer is designed to be a response of God’s Word to you. Paul’s epistles, Romans through Philemon, are God’s Word to you, so if you are unfamiliar with God’s Word to you, you will be praying apart from God’s will. You will not see God work because you will not know what He is doing. Indeed, dispensational Bible study revolutionizes your Bible understanding and your prayer life. “Pray without ceasing” (1 Thessalonians 5:17). “Continuing instant in prayer” (Romans 12:12). “Be careful for nothing; but in every thing by prayer and supplication with thanksgiving let your requests be made known unto God” (Philippians 4:6). Certainly, prayer is a vital part of Christian living, but unfortunately, too many believers pray like Israel or like heathen. There rarely is any genuine Christian prayer, so there rarely is any answered prayer! So, if we are not to pray like Israel, and not to pray like heathen, how then should we to pray? Just as Elijah let God’s spokesman to him, Moses, teach him how to pray, we turn to God’s spokesman to us, Paul, and let him teach us how to pray. However the Holy Spirit prayed for us through Paul, how Paul prayed in the Holy Spirit for us, is how the Holy Spirit will pray for other Christians through us, how we ought to pray in the Holy Spirit. Friends, Paul’s epistles, Romans through Philemon, make it so plain what God is doing today. His will has been clearly revealed, and we are to study those books and make it our will to pray that His will be accomplished. We are not making God doing anything, but rather reminding ourselves of what He already said He would do. Romans 1:8-12, 1 Corinthians 1:4-8, Ephesians 1:15-23, Ephesians 3:14-21, Philippians 1:3-11, Colossians 1:3-12, 1 Thessalonians 1:2-4, 2 Thessalonians 1:3, 2 Timothy 1:3-5, and Philemon 4-6 are all instances of how the Apostle Paul prayed for other Christians. The Berean Bible student will study and consider them, and adjust his or her prayer life accordingly. Firstly, Paul thanked God for other believers. He constantly reminded himself that he was not alone in the Christian ambassadorship. Other people were in the world also suffering for Jesus Christ’s sake, but God’s grace was working in them and so it would work in him in spite of the opposition. He was continually mindful that, as an apostle, God had commissioned him to take care of the Church the Body of Christ. The grace saints in Rome, Corinth, Galatia, Ephesus, Philippi, Colosse, Thessalonica, and in other cities and regions, they were his fruit. It was important that he thus constantly remind himself of God’s Word to him and them, that he see that God’s will for him be accomplished regarding them! Secondly, Paul prayed that these Christians grow spiritually. He did not want them to be “babes in Christ,” but fully mature sons of God! The Apostle wanted them to “come unto the knowledge of truth” (1 Timothy 2:4). He wanted them to understand the doctrines of grace as he had come to know them from Jesus Christ Himself. He prayed that God’s grace would work mightily in them to produce the life of Jesus Christ in and through them! He wanted them to understand God’s power, that the power of God that raised Jesus Christ from the dead, would work in them when they would believe those grace doctrines. Let us study Pauline prayer in greater detail. All too often today prayer is reduced to mere posture and procedure—kneel at the railing, or enter your prayer closet, cross your heart, close your eyes, bow your head, use prayer beads or prayer wheels, and recite what you have read in a prayer book. Dear friends, prayer at its fundamental level is none of those things. “Pray without ceasing” (1 Thessalonians 5:17). Are you going to stay kneeling literally every moment? Should your eyes be closed every second? Is your head to be bowed 24 hours a day, seven days a week? If prayer is kneeling, closing eyes, and bowing heads, then yes, yes, and yes. The truth is, prayer in the Bible is not some formalistic practice, so no, no, and no! When barren Hannah prayed to the LORD, she told the priest Eli, “I have poured out my soul before the LORD” (1 Samuel 1:15). David wrote to Israel, “Ye people, pour out your heart before him” (Psalm 62:8). Romans 10:10 says, “For with the heart man believeth unto righteousness.” The “heart,” our soul, our innermost being, is that which we use to believe God’s Word. Prayer is speaking to God what is in our hearts, and if we have studied and believed our Bible, then we will be speaking to God what He told us. Again, this is consistent view of prayer, regardless of dispensation. Brethren, we are to be constantly reminding ourselves of Paul’s epistles, Romans through Philemon. “Meditate on these things” (1 Timothy 4:15). “Consider what I say; and the Lord give thee understanding in all things” (2 Timothy 2:7). Day in and day out, we should be thinking about God’s Word to us, reminding ourselves of what He said to us. This is Pauline prayer. This is answered prayer. Rabbi Shaul was one of the most educated Mosaic scholars of his day. From a very early age, he had studied the Mosaic Law. Learning those Old Testament scrolls, he came to understand that whenever his people Israel suffered any sickness/plague, war, calamity, et cetera, it was divine punishment. He noted how Israel’s conversion and prayer resulted in God removing the problem. Once “Rabbi Shaul” became “Apostle Paul,” he was intensely persecuted. To Gentiles and Jews alike, he was a renegade Jew, a peculiar fellow. Formerly a religious leader who could not stand to even hear the name “Jesus of Nazareth,” now a “religious leader” who could not stand to be silent about the name of Jesus Christ! Now that he was not preaching Judaism, Israel was after him! Now that he was preaching an illegal religion, Rome was after him! Now that he was not preaching blasphemy, Satan was after him! We read in 2 Corinthians chapter 12: “ For though I would desire to glory, I shall not be a fool; for I will say the truth: but now I forbear, lest any man should think of me above that which he seeth me to be, or that he heareth of me. And lest I should be exalted above measure through the abundance of the revelations, there was given to me a thorn in the flesh, the messenger of Satan to buffet me, lest I should be exalted above measure. For this thing I besought the Lord thrice, that it might depart from me.” Satan afflicted Paul with something that constantly irritated him (there is Scriptural evidence that it was likely ophthalmic in nature). Three times Paul prayed to the Lord for deliverance, and Paul was shocked to learn the Lord’s answer. The ascended, risen, and glorified Lord Jesus Christ revealed the mystery to the Apostle Paul over the course of nearly 35 years. This information was completely different from what God had revealed to the Old Testament prophets, the writings Paul had studied intensely when he was lost (see Romans 16:25,26, Ephesians 3:1-12, and Colossians 1:23-27). Now that God had ushered in a new dispensation, Paul had to think differently about God. He had to quit praying according to the old divine revelation, and pray according to the new divine revelation. “We know not what we should pray for as we ought” (Romans 8:26b). Since there was more revelation from God coming, Paul was, in 2 Corinthians 12:8, not praying according to the new program. He was still thinking of God’s promise to deliver Israel from problems. Verse 9, “And he said unto me, My grace is sufficient for thee: for my strength is made perfect in weakness.” There, in that awful, vexing circumstance, Paul learned one thing—God had given the grace, the capacity, to endure it. Rather than deliverance, Jesus Christ promised inner strength, inner fortification, inner power, to bear the trouble. Paul had to readjust his view of problems and prayer, and we will let him tell us how we should go about doing it. Initially, Paul, assuming it was harmful, begged the Lord three times for deliverance. Verse 9 of 2 Corinthians chapter 12 says, “And he said unto me, My grace is sufficient for thee: for my strength is made perfect in weakness.” In other words, “Paul, I have something far better in mind for you than deliverance! You are weak but I am strong! I have already given you enough grace, an inner capacity, to handle your problem!” What was Paul’s reply? “Most gladly therefore will I rather glory in my infirmities, that the power of Christ may rest upon me.” Paul finally saw the value in times of suffering. Jesus Christ’s power would bear him up. Rather than the troubles destroying him, He would use them to Paul’s advantage. The Berean Bible student will notice, “He said unto me…,” a direct reference to God’s spoken Word. We have to see what God says to us. We find God’s Word to us about suffering in other passages such as Romans 5:1-5, Romans 8:18-28, 2 Corinthians 1:3-11, and 2 Corinthians 4:16-18. There are so many dear precious saints praying to escape their problems, when Jesus Christ has already said He wants to live in them in the midst of those difficulties! Let us now see how we are to pray in difficult circumstances. Many precious Christians all around the world, suffering various difficult circumstances, are fervently praying for God to remove those tribulations (remember Paul?). Yet, the troubles remain (remember Paul?). They wonder, “Does God love me? Do I have enough faith? Is there unconfessed sin hindering my prayers? Am I even really saved?” Such disappointment, misery, and confusion! Beloved, remember, prayer is talking to God in light of His Word to you. The most basic fallacy in modern-day prayer-practice and prayer-preaching is to grab God’s Word to Israel, and make it apply to us. Whether it is “the Lord’s Prayer” (Matthew 6:9-13), or “Whatsoever ye shall ask in my name, that will I do” (John 14:14), or “If two of you shall agree on earth as touching any thing that they shall ask, it shall be done for them of my Father which is in heaven” (Matthew 18:19), none of these verses apply to us. God the Holy Spirit never gave us the Church the Body of Christ any such verses in Romans through Philemon. In fact, as we already saw in Paul’s epistles (2 Corinthians 12:7-10), we find God saying “No” three times to Paul’s prayer for deliverance. Surely, God’s dealings with Israel and God’s dealings are different. In Israel’s program, calamity was a sign of disobedience and God’s punishment of it. However, when we come to this the Dispensation of Grace, problems are not something to flee. God is not mad at us; we are forgiven and accepted in Christ. We suffer trouble in this fallen creation, but we need to always be mindful that God promises to get us through our trying times, not take us out of them. In difficult circumstances, we need to repeat to Him in prayer what He told us in Scripture. The “dispensations,” or sets of divine revelation that mankind is to believe and obey during precise time periods, change throughout time. Prayers are spoken according to God’s instructions specific to that time, so the contents of believers’ prayers vary from Genesis through Revelation. “The effectual fervent prayer of a righteous man availeth much” (James 5:16). There is much profit in prayer today, provided that we pray in accordance with the “Dispensation of Grace” (Ephesians 3:2—Paul’s epistles, Romans through Philemon). Prayer reminds us of the Scriptures applicable to the current dispensation and our life circumstances: if we pray in accordance with a former dispensation (such as God’s Word to Israel), prayer will not impact our Christian lives as God intended, thus resulting in more unbelief, disappointment, and confusion. Two of the best prayer verses for this dispensation is what our Apostle Paul wrote in Philippians 4:6,7: “ Be careful for nothing; but in every thing by prayer and supplication with thanksgiving let your requests be made known unto God. And the peace of God, which passeth all understanding, shall keep your hearts and minds through Christ Jesus.” What great memory verses! Paul’s epistles never mention guardian angels. Angels have no ministry to us: they do not serve us as they did Israel. Paul and his ministry companions suffered a variety of problems. No “guardian angels” rescued Paul in 2 Corinthians 11:22-27 (a passage replete with stonings, beatings, shipwrecks, ambushes, imprisonments, hunger, thirst, weariness, painfulness, poverty, nakedness, and cold)! After experiencing this partial listing of problems, Paul’s life ended… with evil Emperor Nero beheading him! The Apostle’s extensive abuse and excessive torture endured over his 30 years of travelling, he undoubtedly had health issues (massive scar tissue, maiming, maybe broken bones and/or lameness). Some of his “infirmities” are in 2 Corinthians 12:10 and Galatians 4:13-15. How did Paul ever survive those hardships? How did he not give up? It was God’s grace working in him. He remembered God’s grace was sufficient (2 Corinthians 12:9). God’s grace was sufficient for ill Timothy (1 Timothy 5:23) and sick Trophimus (2 Timothy 4:20), and for the poor Macedonian Christians (2 Corinthians 8:1,2). This grace is sufficient for us too, and we are mindful of it when praying in our circumstances, good and bad. Some have erroneously concluded that unless we use the same words Elijah used, we will not see results from God. The greater fallacy, however, is to mix our Dispensation of Grace with Israel’s Dispensation of Law. While we can pray for God to demonstrate Himself as when He did with Israel (signs, miracles, wonders), God will not do it because He never said it to us. As we saw “long ago,” God hearkened to Elijah because he was quoting Scripture that applied to him. Elijah valued (believed) God’s Word, he wanted God’s will accomplished, and because he prayed for God to do what He had already said He would do, Elijah saw God’s response! What is God’s will in this the Dispensation of Grace? “[God our Saviour] Who will have all men to be saved, and to come unto the knowledge of truth” (1 Timothy 2:4). Today, God wants lost people to trust Jesus Christ (Paul’s Gospel; 1 Corinthians 15:3-4) to be saved from a devil’s hell, and He wants saved people to trust His Word to them (Paul’s epistles, Romans through Philemon; Romans 11:13) to be saved from a devil’s lifestyle! Firstly, we should pray for lost people to be saved from their sins by trusting Jesus Christ’s finished crosswork as the sufficient payment for their sins. Secondly, we need to pray for fellow Christians to learn how to understand and enjoy the Bible. Thus, we will be motivated to share the Gospel of Grace with lost people, and share dispensational Bible truths with Christians. God wants law-abiding leaders and citizens, godly husbands and fathers, virtuous wives and mothers, obedient children, hardworking employees, benevolent employers, and faithful saints who maintain the local assembly. Beloved, honestly, we Christians need to quit wasting our time praying denominational prayers and we need to start praying for these things! Just imagine such transformation! When we pray for things and do not get them, it is not because God is unconcerned or unloving. Oh, dear saint, never entertain such foolishness! Unanswered prayer results when we demand He do for us what He said He would do only for Israel. Rather than praying as denominational tradition encourages—asking God to remove or protect us from problems (“give me good health, safe trips, ‘miracle debt cancellation,’” and so on)—we remember God’s attitude concerning contentment, that Jesus Christ strengthens us to handle all circumstances, good and bad (Philippians 4:11-13). Father God is concerned, for He gave us His power to endure our difficulties. We find value in tribulations, for these troubles work patience, which works experience, which works hope, and hope makes us not ashamed, “because the love of God is shed abroad in our hearts by the Holy Ghost which is given unto us” (Romans 5:1-5). Troubling times remind us that we are weak, insufficient in and of ourselves; however, God’s grace, love, and power will get us through them. We rely more on Him, experiencing more fully and using the provisions He gave us in His Son: His peace consoles us in our difficult circumstances (2 Corinthians 1:3-11). Our focus should not be on what we can see (physical circumstances), but, by faith, seeing what we cannot physically see—God’s Word working in us as we endure those troubles (2 Corinthians 4:16-18). “For I reckon that the sufferings of this present time are not worthy to be compared with the glory which shall be revealed in us” (Romans 8:18; see also verses 19-28). The indwelling Holy Spirit takes this sound doctrine that we believe and pray (Romans 8:26,27), and activates it (1 Thessalonians 2:13; Hebrews 4:12), causing us to not only understand it but enabling us to have the life the doctrine describes. Why did Elijah pray like this, what was so special about his prayer that God answered it, and how can we have our prayers answered of God? Dispensational Bible study guards against such Bible mishandling. There are no such promises of signs, miracles, and wonders, given to us in Paul’s epistles, Romans through Philemon. Rather, God is working invisibly today. “We walk by faith and not by sight” (2 Corinthians 5:7). Today, God’s Word is working in us when we believe it, to “renew our minds” (Romans 12:2), to “renew our inner man” (2 Corinthians 4:17). Paul, our pattern, was never spared trouble. Rather, he had God’s power so that the trouble would not destroy him. This is our identity in Jesus Christ, our provisions in Jesus Christ, to handle all circumstances, good or bad (Philippians 4:13). » How should I pray? » Should I pray or speak in tongues? NOTE: We are greatly delighted to formally announce the grand reopening of our online Bible study resource bookstore! 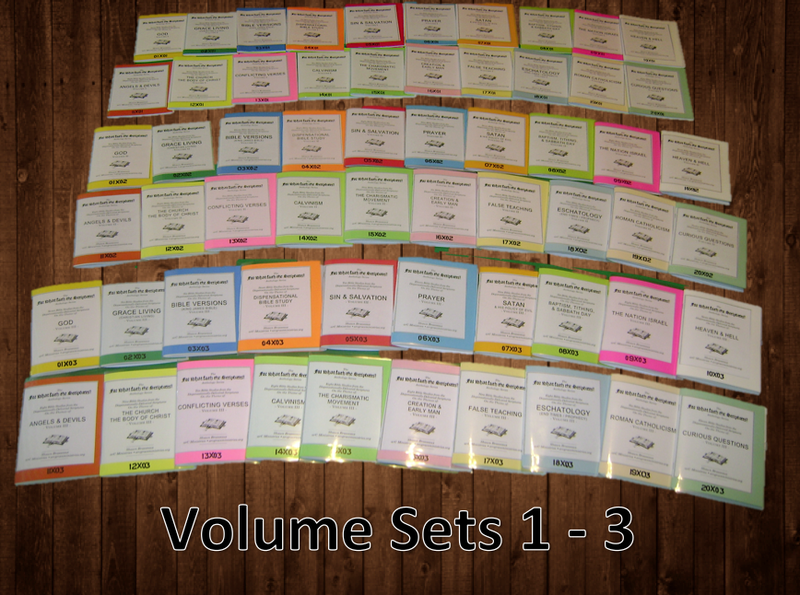 Currently, we have 60 booklets available for purchase, encompassing over 450 studies, 20 themes, and over 3,000 pages. Catalogs and ordering info can found at https://arcgraceministries.org/in-print/booklets-bible-q-a/. We are honored to provide this service to you and these written materials for you! Your support of the ministry is greatly appreciated! Please share this with others.